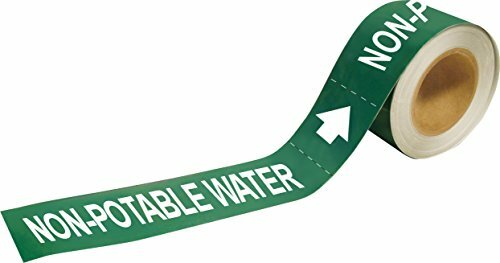 Brady 109528 Economy Pipe Markers-To-Go, B-946, 2" Height X 12" Width, White On Green Pressure Sensitive Vinyl, Legend "Non-Potable Water"
Roll form pipe markers eliminates need for precise measurement of pipe diameter - simply cut to the size you need from 30' long roll. B-946 Vinyl adheres to itself for easy wrap-around marker installation. Legend repeats 65 times per roll. View More In Pipe Markers. Brady 41462 Roll Form Pipe Markers, B-946, 8" X 30', White On Red Pressure Sensitive Vinyl, Legend"Fire Protection Water"